In September 1996 47287 leads the 6O92 Exeter Riverside – Dollands Moor, China Clay service up Whiteball bank leaving Devon. Speedlink and Railfreight were the early examples of a BR sector based approach. Speedlink operated from 1977 to 1991 and was an air-braked wagonload freight service, i.e. where a freight trains comprised individual wagon consignments for customers. It was created to address the declining levels of wagonload business. BR had been piloting a high-speed freight service, introduced in 1972. The service operated fixed timetables linking a small group of key destinations – as opposed to the traditional wagonload service that operated through marshalling yards. The approach produced positive results – operations expanded from 29 trains per day in 1977 to 150 per day in 1984. Speedlink continued operations until it was (along with BR’s Freightliner intermodal container operation) subsequently integrated into a new Railfreight Distribution sector in 1988. Railfreight was BR’s dedicated freight division created in 1982 to control all network freight operations by dedicating particular stock and teams to manage evolving freight traffic demands. The Railfreight division operated as a single entity for BR’s rail freight until 1987. 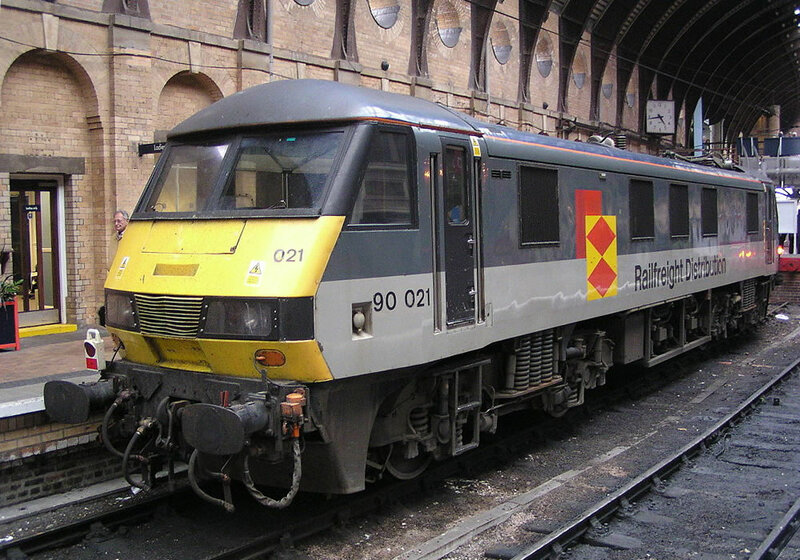 The Railfreight sector brand was immediately identifiable through the introduction of a new “Railfreight Grey” livery with the BR double-arrow logo. 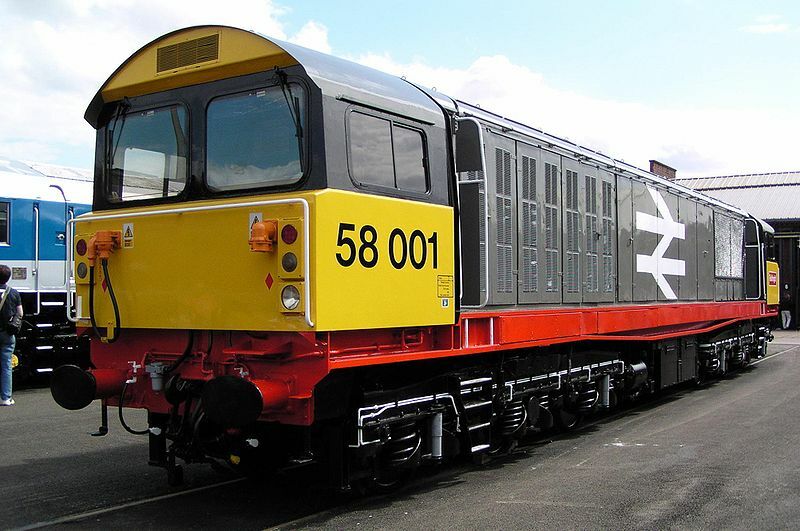 This was based on the Railfreight “Red Stripe” design created for the new Class 58 locomotive and included black window surrounds, wrap-around yellow cabs, and a red cab-side plate/label with the name “Railfreight” in white letters. The sector also used a “Two-tone Grey” livery. However, BR Railfreight operational performance was to prove unsatisfactory to some major customers. In 1985, a portent of the prospect of rail privatisation appeared when quarry company Foster Yeoman (now Aggregate Industries ) acquired 4 (subsequently 5) powerful North American 3600 hp locomotives from General Motors (GM-EMD), to haul heavier and longer loads from its Wiltshire, Merehead quarry (Torr Works) to stone terminals in the South East. Whilst the locomotives were designated BR Class 59 (59/0) and manned by BR staff, they were owned and maintained by Foster Yeoman; the first major company to run private locomotives on BR track. The 59s proved both reliable and successful and in 1990 quarry company ARC (now Hanson ARC) and privatised electricity generator National Power (in 1994) adopted the Foster Yeoman approach and bought Class 59s (four 59/1s and six 59/2s respectively) to haul their own trains. In 1993, Foster Yeoman and ARC combined their 9 locomotives and rolling stock and formed one streamlined operation, Mendip Rail. This created the third largest freight company in the UK, delivering aggregate material for major infrastructure works, including the Thames Barrier, the Second Severn Crossing, Channel Tunnel and, more recently, Heathrow (T5). In April 1998 National Power rail operations were taken over by English, Welsh and Scottish Railway (EWS). Rail Express operation handled parcels traffic. Any operations not assigned to either Trainload Freight or Railfreight Distribution were handled under a Railfreight General branding, although its limited responsibilities were later taken over by Railfreight Distribution. The sectors were given distinctive individual branding. Trainload Freight (TLF) was formed in October 1987 out of the previous Railfreight trainload (block-train) freight operations division and continued until BR privatisation in 1996, albeit reorganised again in 1994. At the outset , the company was authorised to acquire 100 Class 60 locomotives. The TLF division was divided into separately branded industry sub-sectors, to service high-volume customers; these were Coal, Construction, Metals, and Petroleum. Each sub-sector locomotive was given a coloured identification decal/logo positioned between the centre body side and the cab; the branding was also supported by a vertical decal “repeater” strip adjacent to the offside cab door. Where a sub-sector had insufficient resources available, it was often practice to borrow available assets from another sub-sector. The following sections provide more background to each sub-sector’s activity and branding. The Coal sub-sector included merry-go-round block coal train movements for power stations and provided resources steel and cement works, Fly Ash and Nuclear Flasks. The Coal sub-sector decal was made up of a yellow square, containing four black diamonds, offset over a smaller black upper square. The decal repeater displayed black diamonds on a yellow strip. The Construction sub-sector included aggregates, self-discharge trains, cement, lime, and gypsum trains, refuse, and Channel Tunnel materials. The Construction decal contained alternate small blue and yellow squares, formed as a square and offset on top of a blue square. The repeater strip was alternate blue and yellow squares. The Metals sub-sector serviced iron ore, slab, semi-finished products, wire coil, scrap metal, aluminum, and limestone. The Metals decal contained alternate blue and yellow chevrons, formed in a square, offset on top of a blue square. The repeater strip displayed alternate blue and yellow chevrons. The Petroleum sub-sector included oil, petroleum, chemicals, bitumen, LPG, aviation fuel, and locomotive fuel operations. The Petroleum decal was made up of a square of alternate blue and yellow waves, offset on a blue upper square. The repeater strip contained blue and yellow alternate waves. Railfreight Distribution (RfD) was created by the division of BR’s earlier Railfreight sector. RfD was responsible for non-trainload freight operations, as well as Freightliner and Intermodal services. In its early years the division was occasionally referred to as Speedlink Distribution and RfD was also responsible for freight operations through the Channel Tunnel. RfD employed a two tone grey livery, similar to those adopted by the TLF and Railfreight General subsectors. In 1992, in advance of the Channel Tunnel opening, a revised ‘European’ livery was created, embracing dark grey (upper) and light grey (lower) body sides, a dark blue roof and three silver rings (decreasing in size) on the cab side. “Railfreight Distribution” lettering was applied along the lower body. Thirty Class 92 locomotives were procured for RfD in preparation for freight working through the Channel Tunnel. Further Class 92s were also procured by Eurostar and SNCF and were originally set for Nightstar international sleeper services, which were later cancelled. RfD had planned for the class to operate between Wembley Yard and Dollands Moor, and Edinburgh/Glasgow and Calais. However, this plan later proved to be problematic. The Distribution decal consisted of two red diamonds on a yellow background offset on top of a red square. The repeater strip was formed of interlocking red and yellow triangles. Distribution included Speedlink, Channel Tunnel traffic, MOD, china clay, automotive, grain, sand, timber, other miscellaneous traffic, and London Transport tube trains. Container traffic was initially included but it was transferred to BR’s Freightliner Ltd subsidiary in 1995. The Railfreight General sector covered any operations not assigned to either Trainload Freight sub-sectors or Railfreight Distribution. The decal design encompassed alternate red and yellow rectangles, formed into a square, overlapping a single red square. The repeater strip displayed alternate red and yellow rectangles. As previously mentioned, the Railfreight General sector was short lived, after being launched in 1987 with a fleet of only 4 locomotives, it was disbanded and taken over by RfD in 1989. The Rail Express division started in 1988 and was rebranded Rail Express System in 1991. It remained unchanged throughout the sectorisation process, until it was the first to be acquired by EWS (at the time North & South Railways), in December 1995. This period witnessed continued freight sector reorganisation, the demise of BR, and the emergence of private enterprise. In 1994, the TLF business sectors were re-formed into 3 shadow freight franchises: each responsible for all types of traffic within its own area. These were Loadhaul, Mainline Freight and Transrail. Each commanded its own livery style, with the original sub-sector decals and BR double-arrow logo ceasing to be used. TLF’s objective was for the new operational brands to compete against each other – as a precursor to privatisation sale – and this situation remained in place until privatisation. The three Trainload Freight sectors were acquired in February 1996 by a consortium led by Wisconsin Central Ltd , a subsidiary of the Canadian National Railway (CN); ownership was then transferred into the new EWS company. Transrail had the largest operating area of the three franchises that included Scotland, Wales and the North and West of England. The company developed a long distance wagonload train service branded “Enterprise”; this was later operated by EWS as the “EWS Enterprise” service. Transrail locomotives retained the TFL two-tone grey livery. Body sides sported a white capital “T”, on a blue circle background surrounded by red and white circles, underlined by two red stripes. The name “TRANSRAIL” was applied in white capitals below the line. Mainline Freight operations were centred on South East England, East Anglia, and the East Midlands. The Mainline locomotive livery comprised a medium blue body with a horizontal white line along the centre. The brand “Mainline” was placed below the line, with a white circle and double white striped circles, either side, located above the line. Some locomotives retained their original two-tone grey and were instead provided with circles in blue and yellow and “Mainline” in black. Loadhaul operated in the North East and its main customers were the coal fired power stations in South Yorkshire and British Steel works in Scunthorpe and Lackenby. The Loadhaul locomotive livery comprised black body sides, cab surrounds and roof, with orange cab sides and yellow front ends. This was supported by a large logo on the middle body side, comprising a white top panel with “Load” in black and a lower grey panel with “Haul” in white. During this later period, RfD sector’s main focus had been on Channel Tunnel, traffic using the 30 Class 92 locomotives. Unfortunately, tunnel traffic proved significantly lower than expectation and the level of activity was adversely affected when the then Railtrack authority implemented new signalling regulations, relating to interference caused by locomotives. As a result, class 92 locomotives were barred from a number of planned routes. RfD continued to operate Freightliner and Channel Tunnel activities until 1995 and 1997 respectively. The Freightliner scheme used the standard two-tone grey livery, supported by a red triangle and red hypotenuse band. In readiness for privatisation Freightliner assets were transferred, in 1995, into a new company Freightliner Ltd.
With the sale of RfD imminent, potential buyer EWS initially considered purchasing the sector without the Class 92s. However, the sale of RfD to EWS took place in November 1997 – and included the Class 92s. EWS marketed former British Rail sector as ‘’EWS International’’, with workings having a vague similarity to the old Speedlink operation becoming ‘’EWS Enterprise’’. The RfD livery continued well after EWS acquisition, as evidenced below, by Class 90 electric 90021’s appearance at York in 2004. Revised Railfreight Distribution livery, as carried by Class 90 no. 90021 at York, June 2004. EWS was itself later acquired by DB Schenker Rail (UK). Freightliner Ltd (1995), was the shortly afterwards (1996) taken over by the Freightliner Group. Today, it is the UK’s second largest freight operator – after DB Schenker Rail. During this period Direct Rail Services (DRS), was formed in 1995 to handle nuclear flask movements. DRS is a wholly owned subsidiary of the Nuclear Decommissioning Authority (NDA). Eurostar owned seven units of the class 92, which never saw service until they were sold in 2007 to Eurotunnel, for use by subsidiary Europorte 2 (now Europorte Channel). Europorte now has a fleet of 16 Eurotunnel Class 92s and hopes to use them on short haul traffic through the tunnel into France, given that they are the only freight locomotives allowed to use the tunnel. The last two decades of BR, prior to 2000, demonstrated the evolution of freight operations and their branding in the UK – ultimately leading to privatisation. This change has been reflected across Europe with open access arrangements now prevalent in the European railway network. This entry was posted in Railways and tagged British Rail, Channel Tunnel, EWS, Freightliner, intermodal, Loadhaul, locomotive, Mainline Freight, Railfreight, Railfreight Distribution, Sectorisation, trainload, Trainload Freight, Transrail Freight, wagonload. Bookmark the permalink.